Clearing and brushing leaves, dust and debris from your garden can be a real chore, but there is a better solution to keeping your lawn tidy. Using one of the best gas leaf blowers to clear them away, is quicker, more effective and less work for you. If you are considering buying a gas-powered leaf blower there are several points you need to consider, not least, is which type of engine do you want. There are also differences in air output, weight, and even the sort of nozzle which the air blower might have. You will also need to be aware of your gas leaf blower’s noise level, as this has implications which relate to local regulations. With almost all gas leaf blowers you are going to find one of two different sorts of engine, namely 2-stroke, and 4-stroke. Each of them has a number of attributes which vary from the other, and these may play a big part in which type of leaf blower you choose. Two-stroke engines provide a decent level of power but not as much as 4-stroke. Two-stroke engines generally weigh less, and the amount of maintenance required is less on a 2-stroke engine, although both types do need to be tuned-up occasionally. One of the major differences is in how each of them is fueled. A 2-stroke engine uses a mixture of oil and gas, which needs to be done prior to filling its fuel tank. It is possible to buy the fuel premixed if you do not want to do this yourself. Four-stroke engines are simpler, in the sense that they use standard gasoline, and nothing else needs to be mixed with it. This means that 4-stroke is regarded as the cleaner of the two engine types. Gas leaf blowers tend to be heavier than leaf blowers which are battery or electrically powered, not least because of the fuel they carry. Whereas the others will have a maximum weight of around 8-10 lbs. this is normally where gas leaf blowers start. The heavier ones can be over 20 lbs. and although these will certainly give you a lot more power, and air speed, they are going to require some physical effort to carry and use them. Leaf blowers with this kind of weight, will most likely come with a harness so they can be carried comfortably. Gas leaf blowers may be regarded as giving you the best of both worlds in comparison to electrical and cordless blowers. Cordless leaf blowers can only be used for as long as their battery stays charged, and this can vary between 20 to 40 minutes. Obviously, an electric leaf blower has no issues in terms of its power source running out (unless you fail to pay the electric company), but it does have one downside with respect to is the cord. This can limit both the distance it can be used and gives you less freedom to move about. A gas-fueled leaf blower overcomes both issues. First, with a full tank of fuel, a gas leaf blower might last you several weeks before it needs to be refueled, and second as there no cord, there are no limits on distance or maneuverability. The power from a leaf blower is measured in terms of the speed at which it blows out air and the level of airflow. This is how you can differentiate between how powerful each gas leaf blower is. Airflow will be specified in cubic feet per minute or cfm, and the airspeed will be in miles per hour, or mph. Gas leaf blowers are very powerful with air speeds ranging from about 140 mph to over 180 mph. The faster that the air flows from your leaf blower the quicker and more effective it is at clearing leaves. The flow of air to a specific area you are pointing the leaf blower at, can also be influenced by the nozzle, so check which type is supplied by with the blower. Round nozzles are best for general leaf blowing, and tapered nozzles are recommended for focusing the airflow to a specific spot. 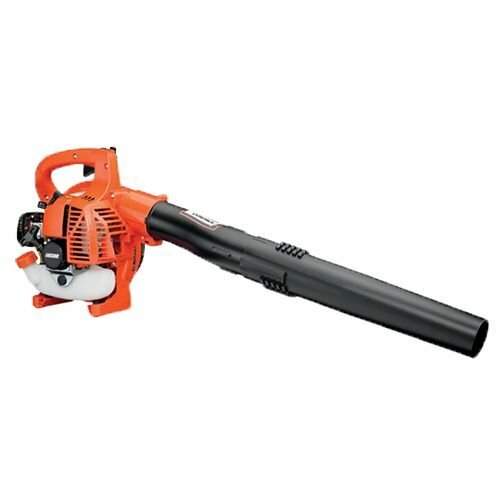 Gas leaf blowers are loudest of all, which can cause you a problem before you even buy one. There are a small number of places where their use is even prohibited because of the noise they produce, so please check that you do not live in one of them. Assuming you can use one, then you must still check whether there are any time restrictions to their use, including certain days of the week when they should not be used. Where there are no restrictions you can still be neighborly and not to use your gas leaf blower at times which may be regarded as unsociable, such as early mornings, especially at weekends. Given how loud they are, and the fact that your ears will be within a few feet of the engine, you should always wear ear protectors when using a gas leaf blower. Another wise precaution is to wear a face mask, due to the fumes which will be produced from the engine. A face mask will also protect you from breathing in excess dust which may be blowing around as you are working. Finally, to protect your eyes from injury due to grit and other small pieces of debris being projected upwards at high speed, always wear a pair of safety glasses when using your gas leaf blower. It is a rare, but very welcome scenario, when you find a gas-powered leaf blower, and all the air power it can produce, without the downside of having a very heavy unit. This leaf blower has a weight of 8.6 lbs. which for a gas leaf blower is light. The added advantage of having excellent maneuverability compared to an electric leaf blower, as there’s no cord to restrict you, should also be considered. Powering this tool is a 2-stroke engine which means you will either have to mix oil and gas or buy it pre-mixed. It produces an airflow of around 440 cfm, and an airspeed of 170 mph. This combination should make the job of clearing leaves, dust, sand, and other debris straightforward, even if some of them have been ground into your lawn. The engine is started using a pull cord, and thereafter using the blower is no different than a cordless or electric blower. On the handle section, you’ll find a trigger which is the blower’s throttle, and by pressing and releasing it you control the speed. There is also an auto-return release switch which helps make restarting the blower simpler, should you release the trigger. To help you focus the air flow to those spots where you want it, the nozzle tapers towards the air outlet. This lets you blast leaves and debris that are proving to be more difficult to move. The length of a manufacturer’s warranty can indicate how confident they are in the quality of their product and the workmanship that went into making it. With a 7-year warranty on this product, it seems that Hitachi has every confidence in their leaf blower. This gas leaf blower is powered by a 2-stroke engine, so you will have the usual job of mixing the fuel if you don’t obtain it already pre-mixed. It produces an impressive airspeed of 170 mph and an airflow of 425 cfm which are going to be enough to shift most leaves and debris that may accumulate on your lawn or around your yard and pathways. One of the reasons the blower can create this speed is with the design of the fan housing. It sits in line with the handle and the nozzle, which is one of the most efficient ways of engineering these sorts of machines. As we’ve just mentioned the nozzle, it is worth pointing out that the length of it can be adjusted. This allows you to set it to the length most suited to the job or the scenario that is at hand. For example, you might use it at its full length when the leaves or debris you are trying to blow away are in a hard to reach spot. Alternatively, you could shorten the nozzle when you need to use it in a confined space. Operating the leaf blower is a simple matter of starting it with the pull cord, and then holding it in a sensible position. Should you stop it, an automatic reset for the stop switch will mean it can be restarted easily. The weight of the machine is a reasonable 9.4 lbs., which should not present too many issues for most people who want to use it. Stress on your arms is reduced by the fact that the blower has a series of anti-vibration dampeners, and the adjustable handle also lets you locate it in the most comfortable position. With this gas leaf blower, we come across a 4-stroke engine for the first time in our reviews, which means you can simply fuel it with normal gas, and not worry about mixing it with oil. The translucent fuel tank allows you to see when it might need refilling. It can hold just under 18 fluid ounces of gas, so this should provide you more than enough for even the longest of leaf blowing jobs. The other advantage of a 4-stroke, gas powered engine, is that it should give off fewer emissions than the equivalent two-stroke machines. This will be important, especially with regards to EPA or CARB exhaust regulations in relation to fuel emissions. There may also be regulations in your area in respect of the noise, and this is often directed towards gas-powered machines which tend to be noisier than electric or battery-powered models. 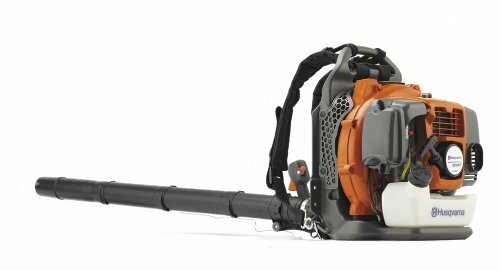 This gas leaf blower incorporates a muffler system which keeps the noise down to just 67dB. Whilst the permitted noise levels may vary across the country, this should be low enough to satisfy most of them. With a powerful engine such as this, you will be expecting to see an equally powerful air output, and that is exactly what you get. The airflow is 356 cfm, with an airspeed of 145 mph. This combination should make this leaf blower more than able to deal with any kind of leaf or debris around your yard or your garden. Operating this leaf blower is very easy, with features such as a soft grip handle to reduce vibration going through your hands and arms, and a cruise control option. The unit also only weighs 9.8 lbs., which is a reasonable weight for this type of gas leaf blower. For a simple gas leaf blower that just gets on with the job of blowing away and clearing leaves, you may want to consider this one from Echo. It uses a 2-stroke engine which as we should know by now, will entail you having to mix oil and gas, or purchasing fuel which has been mixed already. The output of this leaf blower is an impressive 165 mph, with the airflow being rated at 391 cfm. This gives this blower plenty of air power which should enable it to clear both easy to move debris and more difficult material such as ground in leaves. Regardless of how difficult the job in terms of moving the leaves etc. the time it takes should not be an issue due to the fuel tank capacity being 16.9 fl. oz. With the fuel tank, the fuel, and the engine, gas-powered leaf blowers tend to be heavier than other types of blowers such as electric ones. However, this leaf blower from Echo is a relative lightweight, coming in at just 8.8 lbs. This is an important benefit, as it means you have maximum maneuverability, can use it at any distance from your house, and your joints won’t be aching as you do so. Helping to make the blower easy to use, are the controls, which are grouped together meaning you can restart it, and adjust the speed with the throttle, without letting go your grip of the handle. The last, but very important thing to note is the noise level, which is rated at 65 dB, and therefore suitable for areas and environments which are noise sensitive. Lighter than many gas blowers at 8.8 lbs. 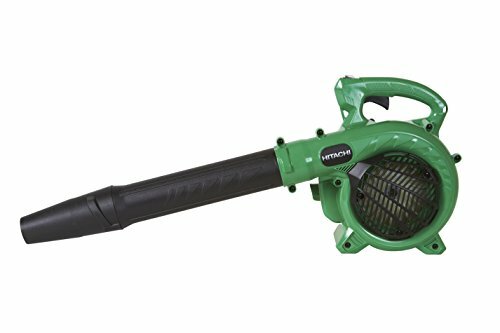 Although this is a small and lightweight gas-powered leaf-blower, it pumps out a very powerful blast of air when it is put to work. The airspeed can be as high as 170 mph, which is among some of the best ratings you will find for a leaf blower. The airflow is equally impressive at 441 cfm, which means any leaf clearing job is going to get done faster. Producing the power which generates that airflow is the blower’s 23.9cc, 2-stroke engine. This has low emissions so your impact on the environment is limited. However, the noise level which it produces is very high in comparison to similar machines. It can reach over 90 dB which means two things. The first is you will need to wear protectors when using it, and the second is you will need to check local regulations in relation to noise level limits. You should find that weight of this leaf blower does not seem much of a burden when you are using it, and this is because it only weighs 8.6 lbs. It is also very easy to operate, with a large throttle level meaning there is less effort to press it when you want the blower to speed up. The handle is situated on top and is ergonomically designed so that you can carry the blower, and balance it perfectly in one hand, whilst you are working with it. The manufacturer obviously believes that their product is going to last you for a considerable time, and it should, given that they offer you a 7-year warranty. Lightweight at only 8.6 lbs. When you come across a gas leaf blower that has a harness, you know that it is likely to be a serious bit of kit, designed for more than clearing light coverings of dust and few random leaves. This leaf blower certainly has specifications and features that lend themselves to that premise. 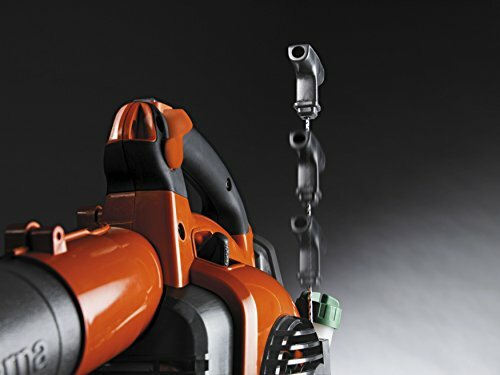 At the heart of the machine is its patented 2-stroke engine, which has been specifically designed by its manufacturer, Husqvarna, to use 20% less fuel, and produce 60% lower emissions than standard two-stroke engines. All this has not been achieved at the expense of the power it can produce. The airspeed can get as high as 180 miles per hour, with an airflow which approaches almost 500 cfm. This should tell you that this leaf blower will shift leaves and debris that many other blowers will simply not be capable of. It will also be able to do it for longer, given that its fuel tank can hold over 42 fluid ounces of fuel. This means you are looking at a potential operating capacity of several hours. Compare that to the mere minutes that a battery powered leaf blower can give you, and you’ll soon realize this is in a different league. Obviously, if you are going to be using this blower for more than an hour, you are not going to do that with any level of comfort whilst holding it in your hand as per other blowers. This is where the backpack element of this leaf blower comes into play. It has comfortable, and ventilated straps. which allow you to carry the weight of the blower on your shoulders, and with relative ease. The fact that the leaf blower weighs 22.5 pounds, will confirm why there is a need for the harness. Other features which add a degree of comfort, include adjustable handles, and controls which are grouped together for easier use. In seeking to choose the best gas leaf blower, we have examined which of them tick as many boxes as possible, across the range of features, specifications, and performance. 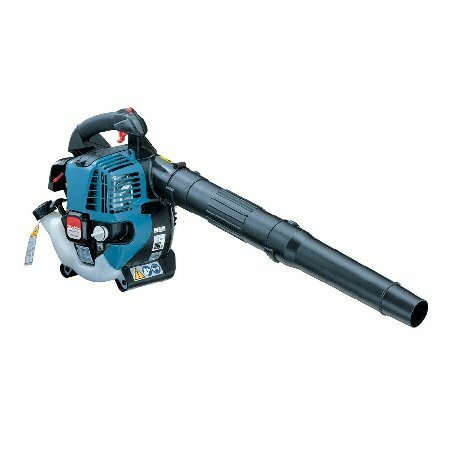 The one which does it more than any of the others is the Makita BHX2500CA Gas Leaf Blower. Its 4-stroke engine immediately has the advantage of using normal gas, and it produces a decent level of power when you consider the airspeed and airflow levels it can reach. It is easy to operate thanks to its cruise control lever; its soft grip handle makes it comfortable to use too. With a noise level output of just 68 dB, it will comply with most noise restrictions, and finally, it can be used in complete confidence thanks to the manufacturer providing you with a very lengthy warranty of 7 years. We are a team of dedicated gardening enthusiasts delivering high quality garden guides. Follow us to learn more about us.